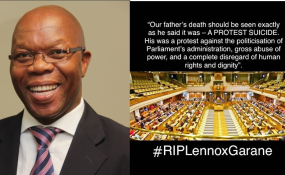 Parliament says it will not respond to "damaging statements" made at the funeral service of Lennox Garane - a senior employee who committed suicide within its precinct two weeks ago. In a speech prepared for delivery at his father's funeral over the weekend in Mount Ayliff in the Eastern Cape, Garane's son Sithembiso blamed Parliament for his father's death, claiming the institution - including its presiding offers - were aware of and failed to resolve his father's 20-month dispute. "Parliament was aware of this, however, they chose - directly and indirectly - to lie to the public by reducing my father's death to a contract dispute," Sithembiso stated in the speech, which was circulated on social media platforms. Garane was also said to have left a suicide note in which he blamed his death on bullies employed at Parliament. He said he was removed from his position and placed in a position he did not want. He claimed that he submitted his complaints to Speaker Baleka Mbete and chair of the National Council of Provinces Thandi Modise. "Twenty months on, I could not take it anymore - I had to resort to this protest action, to get the message across to the perpetrators and protectors of unfairness," his note apparently said. Sithembiso claimed his father was victimised, suppressed and blackballed. He also disputed that his father killed himself after becoming aware on August 31 that his contract would not be renewed. He said his father committed "a protest suicide against politicisation of administration, gross abuse of power and complete disregard of human rights and dignity". In the speech, Sithembiso also named several people who he said failed to act or were to blame. "My father told us that the whole system in our Parliament is broken and he was despondent and did not believe that there is any will by all charged with the responsibility to change the situation. Rather maintaining this system was to their benefit because it kept them powerful." He said the family sought justice and welcomed the inquiry into his death, which was expected to get under way this week. On Tuesday, Parliament responded that it remained committed to assisting the Garane family "to fully heal and find closure" following their tragic loss. "It is with this understanding that Parliament would prefer not to respond to damaging statements made following the funeral service," spokesperson Moloto Mothapo said in a statement. Parliament also warned against the publication of names of people mentioned in the speech. "Parliament wishes to caution against the publishing of names of individuals in connection with untested allegations, as this borders on irresponsibility and may also be defamatory," Mothapo said. The parliamentary inquiry will create an open platform for all affected people to present evidence, Mothapo said. "It will help Parliament address what happened and also assist Parliament to prevent any such occurrence in the future. "Parliament urges all affected people to give space and time for these investigations and for the institution to reflect on and deal with the findings and recommendations," Mothapo added. Garane - a former section manager in Parliament's international relations and protocol division - was found dead on September 14.